A successful panto needs to be firmly rooted in the local area known to the younger members of the audience. It needs to also make sure it doesn't lose them with too many adult jokes. 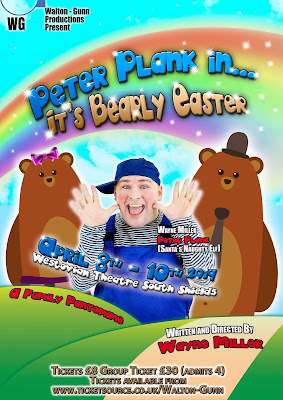 Peter Plank... its Bearly Easter does both of these things with aplomb. Of course, it helps that the show is written by local lad Wayne Miller and stars a local cast. There's no fake north east accents at this panto. Two Bears, Mummy Bear (Melissa Cavanagh) and Daddy Bear (Steven Stobbs) have decided to go for a picnic in the park whilst their son is at school. They meet up with Peter (Wayne Miller) who has followed them since he caught them rummaging through his bins. Whilst they discuss entering a local music show Gannabee Hellon (Stephen Sullivan) appears and spots potential if he captures the bears. Can Peter save the bears? Will the bears get a chance to perform music on stage? The script is littered with jokes that the kids will get. Indeed, the kids around me were shouting out "I get it" and "he's behind you" ahead of any prompts from the stage. There was clearly plenty of panto regulars amongst the young South Shields crowd. The songs with the exception of We Will Rock You, are modern, as fits a show for children. Accompanied by a small troupe of young dancers, the songs worked well with the feel of the show. The young dancers got a number of opportunities to show off their skills. Funnily enough, the dancing probably worked better with having a smaller group of dancers. There seems to be a temptation in some pantos to pack the stage with "babes", as they were once called. This may help ticket sales, as family flock to see their offspring on stage, but it doesn’t add to the production values. Timing wise, the show runs at about 80 minutes plus interval. The 50 minute first act coming to an end just before the audience were wriggling too much. This timing helps make the show ideal for the under 10s. The second act was much more interactive, especially during the take off scene. I've not seen so many kids jumping out of their seats. If they'd spotted the stairs, I'm sure there would have been a stage invasion. The on-stage chemistry between Wayne, Melissa, Steven and Stephen is apparent as they entertain the crowd. Wayne makes it look easy as the panto comic but he has a rare skill that ensures that the comedy works on the kids level. Melissa has the opportunity to show off her vocal talents and Steven gets a number of lines about relationships that the adults in the room appreciated. Stephen continues in his journey from Customs House good guy to the evil one that the kids love to boo at – I have a feeling I know which type of role he gets the most kicks out of. It was the first show of the run and along with that came a few unexpected moments that the cast probably recognised more than the audience – but the hitches that occur in this type of live performance add rather than distract from the experience. In many pantos these events are put into the script deliberately. Peter Plank... its Bearly Easter was a nice holiday treat. The young kids in the audience loved it and the parents left happy. Mission accomplished! 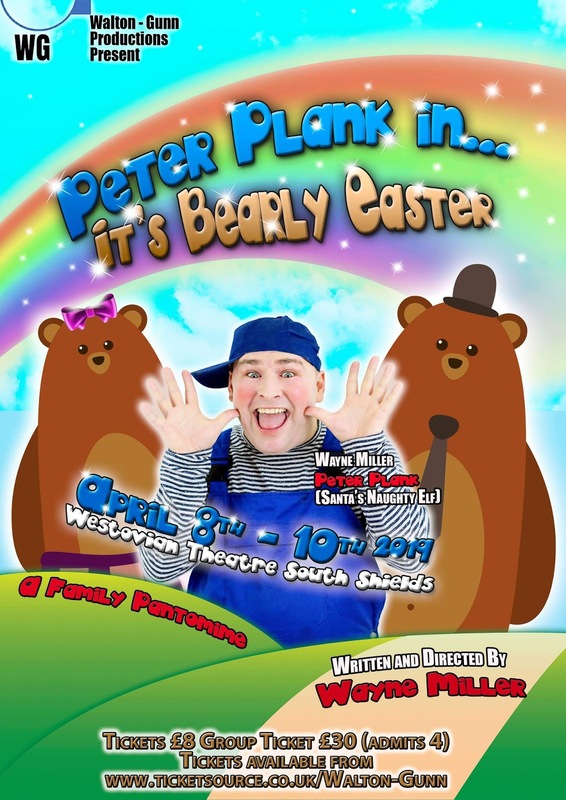 Peter Plank in…It’s Bearly Easter runs at The Westovian Theatre in South Shields from Monday 8th to Wednesday 10th April.